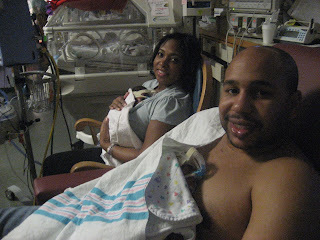 This blog is dedicated to our first children, McKenzie & Lillian, Monoamniotic twins born 11/10/08 at 28 weeks. Sorry I haven't had much time to blog, between the holidays and the hospital I just hadn't found the time...but I wanted to share with you a few pictures!!! 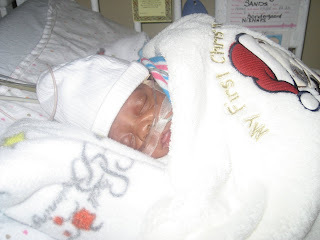 Above: McKenzie's 1st Day in the Crib!! Yay Kenzie! 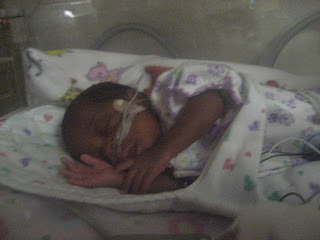 Above: Lillian...napping ... her favorite past time! 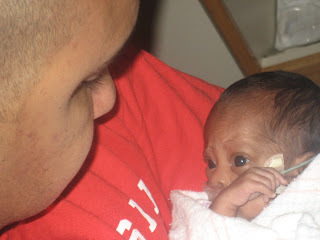 Above: McKenzie and her Daddy... "what you looking at sucka?" 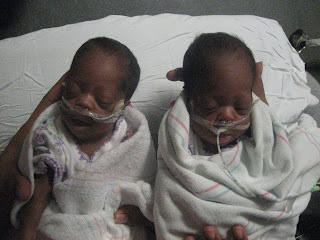 Above: McKenzie (Left) & Lillian (Right) ... Neither one of them wanted to open their eyes...but this is their FIRST picture together!! yay!! 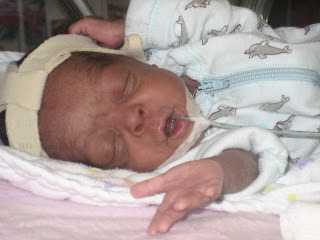 As you can see their feeding tubes have been moved from their mouths to their noses! It's Nippling time!! 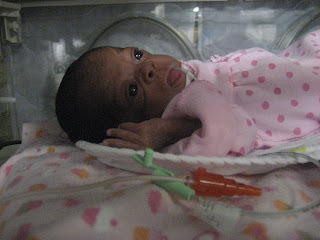 Above: McKenzie's last day in her incubator...showing of her pretty face! :) I love these eyes! I hope you all enjoyed...I will be posting... the Christmas pictures next... hopefully!!! "SHOWER ME WITH YOUR LOVE!" 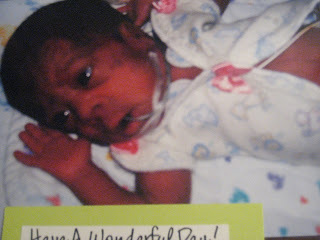 On December 13, 2008 I was the guest of honor at the MOST FABULOUS baby shower any girl could hope for!! "We Work for Lillian & McKenzie"
To the Shower Committee: Thank you all for all your hard work and dedication to making the Sands shower the best it can be. I feel so fortunate to have family and friends that will go above and beyond to make something so grand just for "lil ole me". You all have been an important part of "the process" that it has taken to get our little girlie's here and watching them grow. Your support and your prayers have helped our "new" family remain faithful and kept our spirits strong when sometimes we felt a little weak. The day could not have been more perfect, I wanted to "shout from the rooftops...I LOVE YOU GUYS!!!" 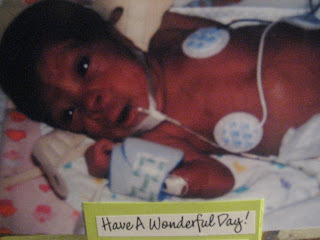 So Again, Thank you Jernee, Nadia, Karimah, Melissa, Sacha, Jibri, Christy, Towanda, Mom J, Ryeshia, Mum & Temika. Here are some pictures from the Fabulous Shower! This shot is from the Parenting 101 game... apparently Everett and I have some talking to do about how we are going to raise the momos!! lol :) He is all about "tough love" but we all know he is a big teddy bear inside!! Check back in 18-24 months to see what actually happened! ha! The YUMMY CAKE!!! By NANA (ask me how you can get a cake from Nana's Cakes) The food and the Decor was WONDERFUL! Loved loved loved the Asian Theme! GIFTS GALORE!!! I swear we have the best family and friends! Thank you to everyone who came to "shower us" from near and far! You all ROCK! I am loving the Twin Elephants...What Do you See in Their future?! hee hee! What is a shower without the embarrassing "bow & ribbon hat" ... And what a good sport my lover is for putting it on! :) Check out his shirt, "Super Dad of the Momos" the back says "Lillian & McKenzie's Daddy"
I cannot thank everyone enough for this special day! It was like a "MTV Super Sweet 16" Party! Sooooo... we have come a VERY long way in the past 4 weeks!! Our little girlie's are growing ever so nicely. I am so proud of their progress. 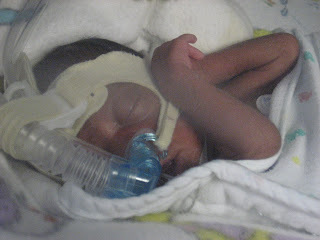 Right now they are both on the CPAP machine, McKenzie is at room air (you go girl!!) and Lily is almost at room air (yay! 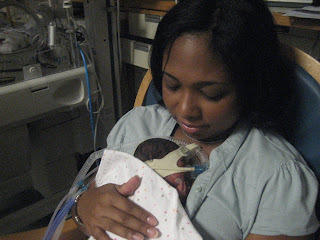 )...On Saturday she switched from SIPAP to CPAP which is a step in the right direction. They are both wearing clothes now!!! 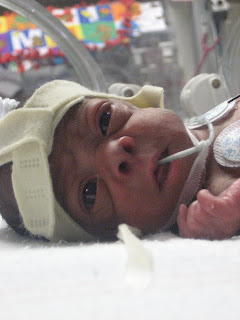 Their preemie outfits swim on them...but they look adorable in them! 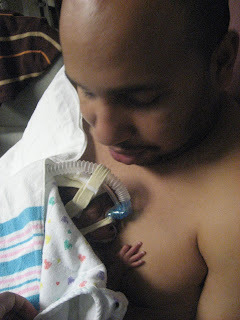 Last week Everett and I were able to snuggle our little muffins with "kangaroo care" loving, we put them directly against our skin and let them feel our hearts and our heat. It was amazing, I had Lily snuggled down my shirt and Everett held McKenzie. They did really well out next to us, I know they know we are their parents, they show us their love through their monitors! 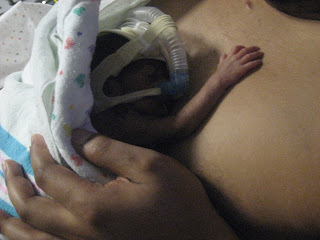 "beep..beep...beep"
Below are pictures of our Kangaroo Care session, it was great, they were so warm and soft! I love how McKenzie has her hand on Everett's chest... like she was patting him saying, "It's okay Daddy!" I have been reading all the posts from everyone! I truly enjoy the messages, words of inspiration and encouragement! I am so grateful to have wonderful family and friends following on our NICU journey...our girls will be home before we know it thanks to all your prayers!